From her website: Dr. Aron earned her M.A. from York University in Toronto in clincial psychology and her Ph.D. at Pacifica Graduate Institute in clinical depth psychology as well as interning at the C. G. Jung Institute in San Francisco. Besides beginning the study of the innate temperament trait of high sensitivity in 1991, she, along with her husband Dr. Arthur Aron, are two of the leading scientists studying the psychology of love and close relationships. They are also pioneers in studying both sensitivity and love using functional magnetic resonance imaging. She maintains a small psychotherapy practice in Mill Valley and San Francisco. Elaine Aron's book The Undervalued Self was available from LibraryThing Early Reviewers. 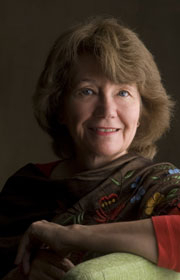 Elaine Aron is currently considered a "single author." If one or more works are by a distinct, homonymous authors, go ahead and split the author. Elaine Aron is composed of 8 names. You can examine and separate out names.